So much lovely food, so little time! 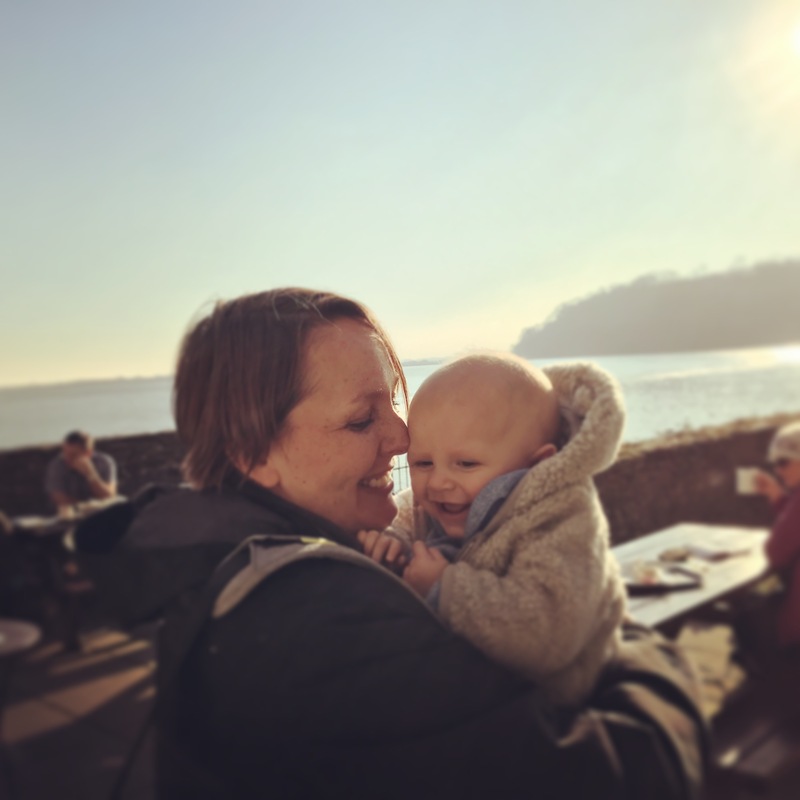 Despite not posting about my Cookbook Challenge for a couple of weeks, rest assured I have been making a recipe (at least one!) 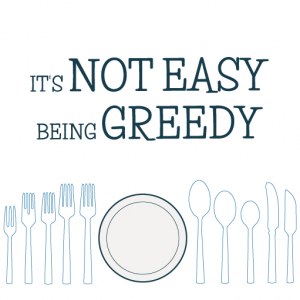 from one of my cookbooks – chosen by Andrew – each week. A few weeks ago, that cookbook was The Magpie Cafe cookbook, which I picked up last year from the Magpie Cafe itself when I went there for fish and chips during a day trip to Whitby. I’d never heard of the cafe but as we wandered around the town (stopping off at the Dracula abbey and pottering around the tiny lanes of pretty shops), I googled “best chippy in Whitby” and asked the same question from my Facebook friends, and the Magpie was a resounding favourite. 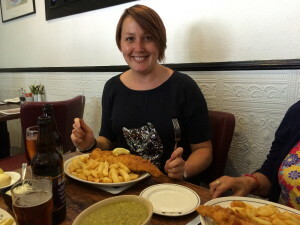 Luckily we managed to get a table and ordered fish and chips all around – despite being told they would be ‘Yorkshire portions’ we could not resist ordering large … a foolish mistake, although I always would rather leave a table full than still peckish. Andrew, the little piggy, also ordered mushy peas, bread and butter and pickled onions. We couldn’t even find room for pudding, although did manage to eat a Mr Whippy ice cream a bit later in the day after another walk to help us digest our chippy. Anyway, I digress – the food was fantastic and so I could not resist picking up one of their cookbooks on my way out. It’s described as including ‘recipes inspired by the North Yorkshire coast’ and by Ian Robson and Paul Gildroy, with a forward from Brian Turner. Andrew said he’d love to have anything and everything from the book, but I eventually decided on tiger prawns in brown ale batter with smoked paprika mayonnaise, followed by cod with an anchovy crust with dauphinoise potatoes (AKA ‘stovies’ up north!). I did contemplate making a pudding from the book but none of them overwhelmed me, and for the ones I might have tried, I had a feeling that other recipes would be better for those particular dishes. 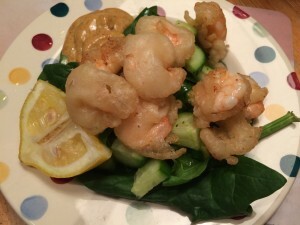 Both of these dishes used techniques I’d never tried before: battering and frying prawns was completely new to me, as was making a crust for fish or meat. 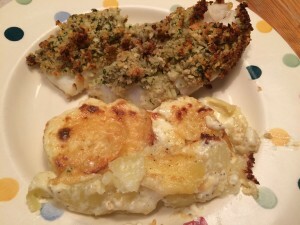 However, both dishes were surprisingly easy to make and extremely tasty – especially after the disappointment of the cod with carrots recipe by Gary Rhodes the previous week. I started off by making the dauphinoise potatoes, which were going to take the longest time to cook. They took just a few minutes to prepare and then simply sat in the oven until baked, so nice and easy to make. I made a very small portion of the potatoes and still had enough for four people as the dish was rich with cream and cheese. 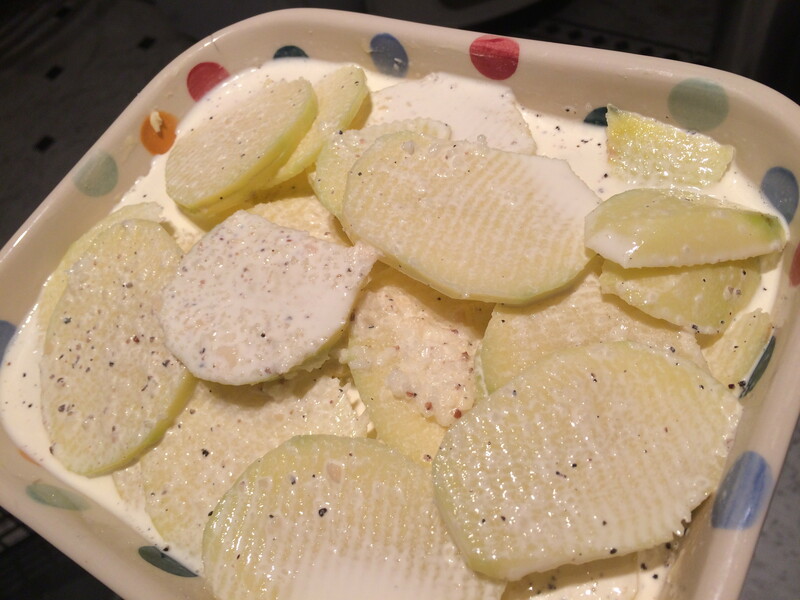 The potatoes would also be a lovely accompaniment to roast lamb or chicken. Then I made the batter using one of Andrew’s bottles of ale instead of the Newcastle Brown Ale suggested in the recipe, simply because he always has plenty in stock and it saves him from drinking some of it! I also halved the portions in the book (they never state how many people each recipe serves, and I’d say every recipe is ‘Yorkshire portion’ style, ie very large). 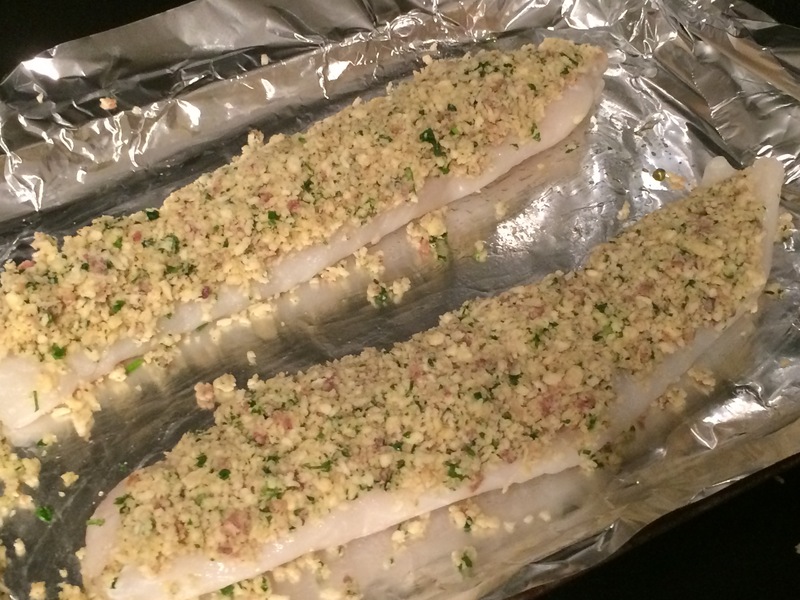 Finally in my preparations I made the crust for the cod – although instead of using bread I used panko breadcrumbs. The ‘marinated anchovies’ in the ingredients list was not entirely clear to me, so I simply used a tin of anchovies and that worked very well. You simply blitz all the ingredients in a food processor ready to be pressed onto the fish before baking, so it couldn’t be simpler. With all the prep done and the potatoes nearly ready, I coated the prawns with their batter and shallow fried them. The batter was a bit like a tempura, it was so light and crispy. 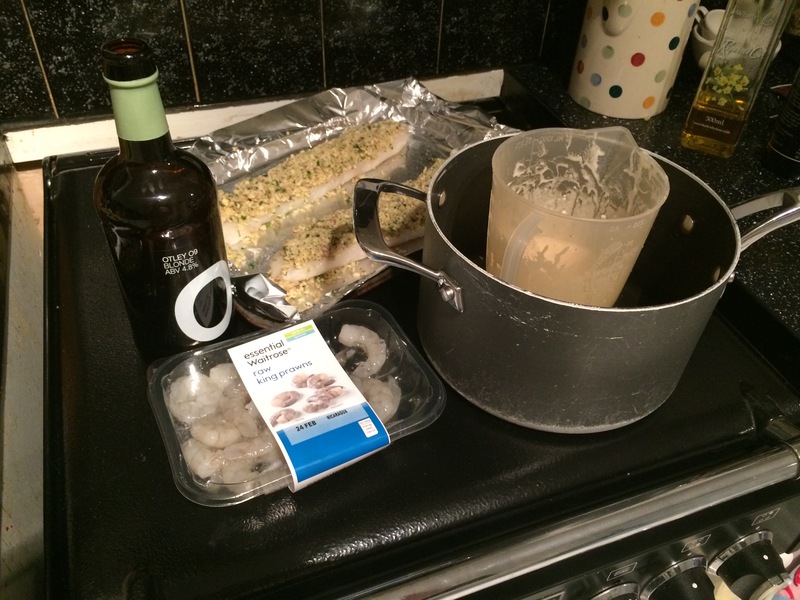 The ale definitely added flavour to the batter and I’d like to make it again to coat fish. I just served them with the mayo (paprika mixed into shop bought mayo) and some salad leaves and it made a good substantial starter – despite southern portions! Make the batter by putting the flour, baking powder and salt into a bowl and then adding the ale and whisking – you might need a little less or more: what you are after is the consistency of double cream. Let the batter mixture rest in the fridge for 30 minutes. Combine the paprika with the mayonnaise to make the dipping mayo. Mix the white wine vinegar, rapeseed oil (you could use extra virgin olive oil), salt and pepper together to make a salad dressing. 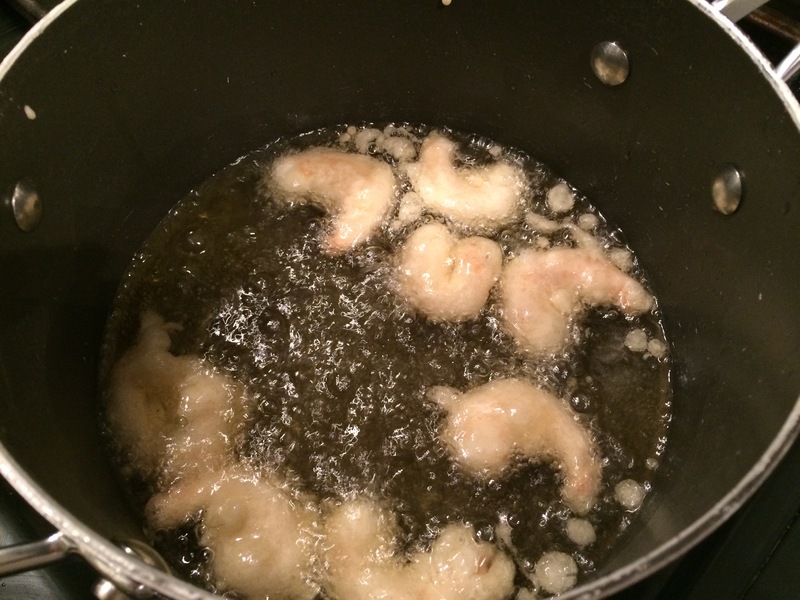 Heat the oil in a large saucepan to 175 degrees (I check if it’s hot enough by dropping a bit of the batter into the oil – when it starts to bubble lightly you know it’s ready to fry the prawns). Dip the prawns into the batter and then gently drop them into the oil, frying for 4-5 minutes until the batter is golden. Take them out of the oil and drain them on some kitchen paper. To serve, put some salad leaves on a plate and dress with the oil and vinegar mixture. Dot the prawns on top and add some mayonnaise to dip them into. Peel and slice the potatoes thinly and arrange in a buttered oven-proof dish. 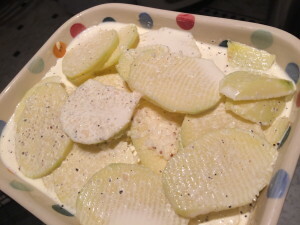 Mix the milk, cream, garlic, salt and pepper in a jug and pour it over the sliced potatoes. Cover with foil and bake the potatoes for 45 minutes at 200 degrees. Then remove the foil, top with the cheese and continue to bake uncovered for 20-25 minutes. For the fish crust, simply blitz the breadcrumbs, anchovies, garlic, lemon juice, butter and parsley until it is combined. 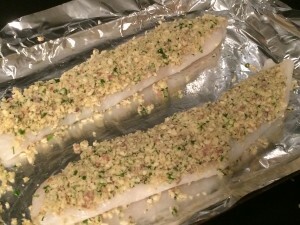 Put the fish fillets on a baking tray, then press the crust onto one side of the fish and bake it in the 200 degree oven for 12-15 minutes until the crust is golden. 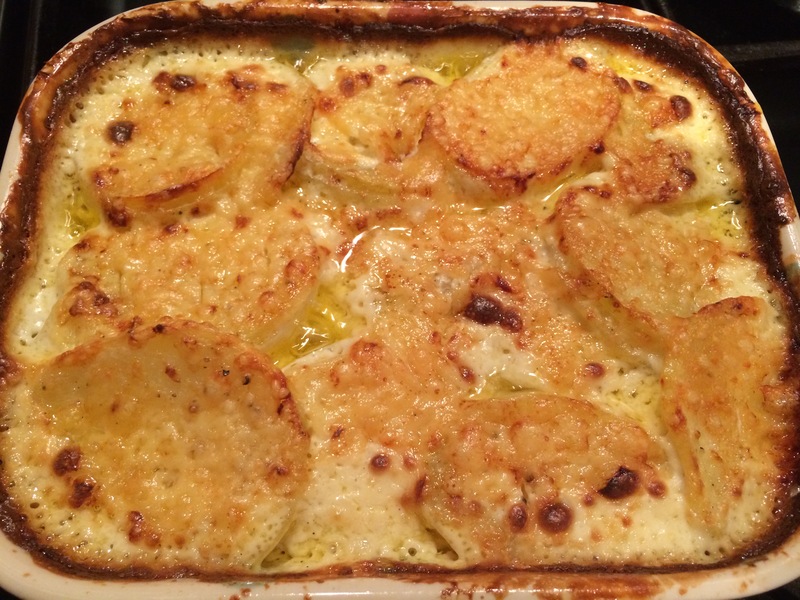 Serve with the dauphinoise and enjoy! Have you ever been up to Whitby, and if so, what’s your favourite chippy?